Kris Vallotton, a pastor at Bethel Church in Redding, California, and the cofounder of its School of Supernatural Ministry, knows his way around the spiritual battlefield. For years he was tormented by a host of demonic assaults, though he didn't know the problems were spiritual. Confused, overwhelmed, he actually contemplated suicide--until the Lord delivered him. Since that time, Kris has spent his life spreading a message of hope and freedom. He's helped people all over the world recognize the devil's stealth attacks and taught them to overcome. Weaving time-tested spiritual warfare tactics with biblical understanding, Kris offers Christians a bold new battle plan, showing how even those in the most devastating of personal battles can be victorious. 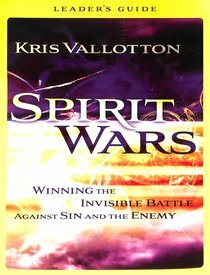 About "Spirit Wars: Winning the Invisible Battle Against Sin and the Enemy (Leader's Guide)"
Kris Vallotton is the founder and overseer of the Bethel School of Supernatural Ministry in Redding, California. He is the Senior Associate Leader at Bethel Church, and has been a part of Bill Johnson's apostolic team for over 26 years. Kris is an internationally recognized prophetic voice, and he and his wife Kathy have trained, developed, and pastored prophetic teams and supernatural schools all over the world. He is a notable speaker with a vision and passion to equip an "Elijah Generation" for the end-times harvest. He has authored numerous books including the best-selling Supernatural Ways of Royalty, as well as Developing a Supernatural Lifestyle, Basic Training for the Prophetic Ministry, and Purity. Customer Reviews For "Spirit Wars: Winning the Invisible Battle Against Sin and the Enemy (Leader's Guide)"
This is a very honest and informative insight into the way our beings (spirit, soul and body) function in the natural and physical realms. Kris uses his own stories taking a VERY transparent approach in the way they are told. This book will help every born again believer on a number of different levels. This is a compulsory book for born again Christians - especially the newly saved. This is an excellent book and one that every christian should read. It goes along way to undo many of the lies about the Christian life and our identities that have been widely taught, accepted and believed within the church. It also gives great (but seldom taught) principals and strategies of spiritual warfare, strategies that shift our focus to our awesome God and put the enemy back in his place...under our feet! This stuff should be Christianity 101 but I have seldom ever heard it taught. Thank You Kris for sharing your amazing story with such honesty and vulnerability and allowing us the chance to learn from your journey.